The lateral thigh free flap is a fascial or fasciocutaneous flap based on the smaller vessels that extend from the profunda femoris system to the skin. These perforating vessels are typically numbered 1-4 in a superior to inferior direction. The flap is usually raised on the third perforator, although the second and the fourth are occasionally used. Since its first description, the flap has proven to be useful in many head and neck reconstructive situations. The flap may be used for very large defects and requires no muscular sacrifice. The lateral thigh flap is reliable, and it can be dissected easily while the head and neck ablative procedure is in progress. Use of the flap allows primary closure of the defect with minimal aesthetic deformity or functional impact. The flap may potentially be split into 2 paddles based on separate perforators, or it can be de-epithelialized to create 2 separate skin islands on the same perforator. A free fascial graft from the lateral thigh area is ideal for defects that require placement of bulk without lining. Performing a sensate flap is also possible. Dissection of the vascular pedicle may be difficult because of anatomic variability. Proper positioning of the leg, use of suspended retractors, wide exposure, and sectioning of certain muscles from the femur are the keys to successful dissection. Although some variability in the vascularity is present, the vessels can be identified easily and preserved with proper surgical technique. An image depicting a lateral thigh flap can be seen below. Initial dissection involves suspension of a rake from a surgical stand to grasp the tough fascia overlying the vastus lateralis. As dissection proceeds medially, the short head of the biceps femoris falls inferiorly. The hemostat indicates the third perforating vessels. The anterolateral thigh flap is a fasciocutaneous flap usually based on the musculocutaneous and septocutaneous perforators of the descending branch of the lateral circumflex femoral artery and its venae comitantes. This flap has gained acceptance in head and neck reconstruction because it has been proven to be a donor site with reliable vascularity, ease of harvest, and extreme versatility. The flap offers the advantages of being pliable with a large cutaneous territory, having a lengthy pedicle with good caliber vessels, possessing multiple components (adipofascial, muscle, fascia, and skin), being used as a sensate flap, and having the possibility of chimeric applications. The descending branch of the lateral circumflex femoral artery is usually of sufficient caliber that a flap may even be based distally. As such, this flap has the ability to cover a variety of large cutaneous or mucosal defects. In special circumstances, it can be combined with other flaps (such as the fibula or iliac crest), using the "mosaic" principle to provide coverage of extremely large and challenging head and neck defects. In addition, the flap can easily be harvested using a 2-team approach without patient repositioning. The donor site can easily be closed primarily without functional deficit or significant conspicuous deformity. About 40% of the time, the donor site requires a skin graft. In elective situations, the graft may be avoided by pre-expanding the flap site for several months prior to flap elevation. Despite skin graft concerns, donor site morbidity is limited. The lateral thigh flap is indicated for large head and neck defects. This flap is quite versatile, especially for defects requiring large flap area or bulk. The flap can be used to reconstruct defects from the nasopharynx to the clavicle. For combined total laryngopharyngectomy, the flap is usually thin enough for total pharyngeal reconstruction, allowing reconstruction without laparotomy for jejunal transfer. For tongue reconstruction, folding the flap on itself and creating a planned tissue protrusion (ie, dog ear) can create bulk in the anterior oral cavity. This protruding skin and soft tissue mimics a neotongue tip. The extra bulk is particularly helpful at the base of the tongue area. The defects most commonly indicated for reconstruction with this type of flap are total glossectomy, total or partial pharyngeal defects, and base of tongue defects. Although size limits for the flap have not been established, skin paddles as large as 16 x 30 cm have been described. Because of its large surface area, the flap provides excellent coverage of large cutaneous defects in the temple and scalp area; however, the tissue match is generally poor because of the pale color of the flap. The flap harvests no muscle, and primary closure of the donor site is usually possible. Split-thickness skin grafts are needed for donor site closure if the width is greater than 8-10 cm. The vessels are usually of good caliber and length. Disadvantages to the free lateral thigh flap include variability of the thigh vasculature and the unfamiliarity of most head and neck surgeons with the thigh area. The free fascial lateral thigh flap takes advantage of the abundant subcutaneous fatty tissue in the lateral thigh. Because of positioning considerations, this flap is easier to harvest than a scapular or parascapular flap. The fatty tissue in the lateral thigh provides a stable, vascularized, volume filler that will not atrophy or resorb over time. This type of flap is most useful in the parotid or temporal area. The free radial forearm flap is an alternative for soft tissue reconstruction; however, it is probably better suited to smaller defects that require a thinner, more pliable flap. The forearm flap is also a good alternative for tubed pharyngeal reconstruction. Both flaps offer advantages to jejunal interposition grafts because neither flap requires laparotomy. The anterolateral thigh flap is usually used for external defects of the head and neck and for oropharyngeal lining. Advantages of the anterolateral thigh flap include easy and safe elevation, minimal long-term donor site morbidity, a long pedicle with a wide arterial diameter, and a large amount of skin that can be used. The flap has good pliability and is of moderate thickness. The flap has been noted to be somewhat thicker in Caucasians than in Asian populations. The flap is especially useful when forearm flaps are too thin or when the morbidity of harvesting a free forearm flap is too great. Flaps as small as 5 X 8 cm and as large as 22 X 32 cm have been used successfully. No major artery of the limb is sacrificed. It can be raised as either a single skin paddle for a 1-layer defect reconstruction or a double paddle for a 2-layer reconstruction. The flap may be designed to be fasciocutaneous, fascial, or musculocutaneous. Adipofascial flaps from the anterolateral thigh have been used successfully to treat hemifacial atrophy (Parry-Romberg syndrome). The vastus lateralis muscle may be included in the flap when a muscular component is needed to cover exposed bone, skull base, artificial dura, osteosynthesis material, or open sinuses. A flap that includes ilium to form an osteomyocutaneous flap has also been reported. The vascular pedicle is approximately 10 cm long, and the artery is approximately 2 mm in diameter. Since the vessels in an anterolateral thigh flap are long and of good caliber, the flap may be used as a flow through flap. With this mosaic or "chimeric" principle, flaps can be combined with bone containing free flaps such as the fibula or iliac crest to replace skin, muscle, and bone in very large defects. The potential exists for making the flap sensate if the lateral femoral cutaneous nerve is included. Performing the flap procedure under epidural anesthesia is possible in those patients not suitable for general anesthesia. Since the donor area is far from the head and neck region, the flap may be elevated simultaneously with tumor extirpation. The patient does not have to be repositioned. Donor defects smaller than 12 cm in width may generally be closed primarily. When closing the donor site, a more important consideration than the absolute width of the flap may be the ratio of the flap width to thigh circumference. If the flap width is less than 16% of the thigh circumference, the donor site may be closed primarily. Inferior to the inguinal ligament, the femoral artery branches into superficial and deep (profunda) branches. The adductor longus muscle acts as a partition between these 2 vessels. The superficial femoral artery courses anterior to the adductor longus, and the profunda courses lateral to that muscle. 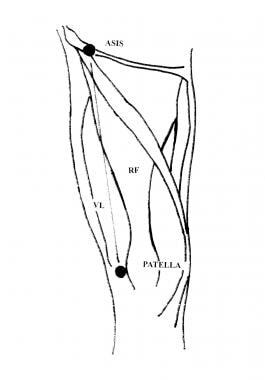 The profunda femoris artery (PFA) gives off several branches that nourish the posterior and lateral thigh musculature, after which they become cutaneous perforators, as shown below. The lateral thigh flap is based on 1 or more of these perforators. Relationship of the perforating vessels of the lateral thigh to the femur is shown. Adductor longus separates the profunda femoris artery (PFA) from the superficial femoral artery. The PFA passes distally between the adductor longus and adductor magnus. Typically, 4 perforating arteries are present, with the number of perforating arteries ranging from 2-6. 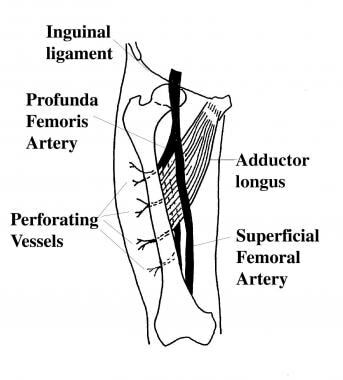 After arising from the PFA, the perforators pierce the adductor magnus and enter the posterior compartment of the thigh. Each perforator has anastomotic branches that lead to other perforators, muscular branches, and cutaneous branches. The first perforator provides the principle blood supply to the adductor magnus. The perforator pierces this muscle before it supplies other muscles or the skin overlying the iliotibial tract. After the PFA passes deep to the adductor longus, it gives off the second (usually the largest) perforator. The second perforator also contributes supply to most of the musculature of the posterolateral thigh. The third perforator is the artery associated with the lateral thigh flap. It arises distal to the adductor brevis insertion on the linea aspera, supplying blood to the musculature in the area. After piercing the adductor magnus at the linea aspera, the third perforator travels as a septocutaneous artery between the vastus lateralis anteriorly and the long head of the biceps femoris posteriorly. This perforator may pass superior to or through the short head of the biceps femoris muscle. This vessel always passes anterior to the long head of the biceps femoris. A wide variation in the position of the third perforator may exist, ranging from 8-32 cm superior to the lateral femoral condyle; however, the vessel is usually located within 2.5 cm of the midpoint of the thigh. If divided at the PFA, the pedicle of the flap is 6-8 cm long and 1.5-3 mm in diameter. The vein is slightly larger. If the 2 venae comitantes of the third perforator converge prior to entering the profunda femoris vein (PFV), a vein 3-5 mm in diameter is formed. Often, a Doppler ultrasonic device is used preoperatively to identify the third perforating vessel. This identification helps to prepare the surgeon for any anatomic variability. The fourth perforator is the terminal branch of the PFA. This vessel arises approximately 7 cm above the knee, where it pierces the adductor magnus and the short head of the biceps femoris. Occasionally, the fourth perforator may be the dominant pedicle to the lateral thigh flap. At the time of surgery, designating the vessel as a particular numbered perforator is difficult to do with accuracy because of the variations in location and size of vessels coupled with the inability to dissect the entire PFA. Despite these uncertainties, an adequate blood supply is present in 99% of thighs. Although the third perforator is usually designated as the vessel that arises distal to the adductor brevis, this muscle is difficult to visualize in a limited lateral surgical view. In clinical cases, regarding the second perforator as that vessel located near the insertion of the gluteus maximus and the iliotibial tract is generally safe. Any vessel distal to the second perforator has been called the third perforator. The terminal vessel that branches from the PFA is named the fourth perforator. Using this method, no more than a single third perforator can exist. Regardless of what a vessel is called, the most important issue is finding a usable vessel somewhere along the long axis of the thigh. The surgeon must be prepared for the variations. The primary function of the intermuscular septal artery is to supply blood to neighboring muscles; thus, the blood flow to the muscles exceeds the supply going to the skin. The caliber of the branching vessels reflects this fact. The lateral femoral cutaneous nerve innervates the flap. This nerve lies just above the fascia lata, after passing deep to the inguinal ligament near the anterior superior iliac spine. The nerve may arborize extensively before entering the flap; therefore, harvesting a wide cuff of subcutaneous tissue around the nerve is best. Anterior lateral thigh flaps are usually based on septocutaneous and musculocutaneous perforators of the descending branch of the lateral circumflex femoral system, although they may occasionally be based on the transverse branch of the lateral femoral circumflex artery in those occasional cases in which the descending branch is absent or small. The lateral circumflex femoral artery (LCFA) is a large branch off either the common femoral artery (25%) or profunda femoris artery (75%). Deep to the rectus femoris muscle, the LCFA divides into ascending, transverse, and descending branches. The descending branch, which is also known as the quadriceps artery, supplies the rectus femoris, the vastus lateralis, and the vastus intermedius muscles. See the image below. The course of the descending branch varies somewhat. It lies totally buried within the vastus lateralis muscle in 22% of individuals. It lies on top of the vastus lateralis in 12% and enters into the muscle more inferiorly in the remainder. In 6% of the population, the descending branch is absent. Routinely, 2 venae comitantes exist with the descending branch. Arterial diameter ranges from 0.2-3.5 mm, while the accompanying venae comitantes measure between 1.8 and 4.0 mm in diameter. Additional pedicle length may be obtained by ligating the transverse and rectus femoris branches. Critical to the success of the flap is the dissection and preservation of at least 1 healthy perforator from the LCFA to the skin. Perforators pass in a septocutaneous (between rectus femoris and vastus lateralis) or musculocutaneous (through the vastus lateralis muscle) pattern. In 60% of individuals, musculocutaneous perforators exist, and in 40%, septocutaneous perforators exist. These perforators usually arise from the descending branch but may instead arise from the transverse branch. About 2% of the time, the surgeon may be not find a useful perforating artery and vein. In these cases, the other leg may be used as the donor site, or the flap may be converted to an anteromedial thigh flap. Local trauma and previous surgery to the thigh may be contraindications to use of this flap. The lateral thigh free flap is least useful in small defects or in cases in which lack of space may compress the flap. This flap is also contraindicated in patients who would not be candidates for any free flap. Patients who lack recipient vessels, who are poor risks for prolonged anesthesia, and who have impaired vascularity to the leg are not candidates for this type of surgery. Nevertheless, free tissue transfer has been performed successfully in patients who are elderly, in people who smoke heavily, in individuals with diabetes mellitus, and in patients who have had previous radiation to the neck. In men, the flap may be hairy. Generally, a poor color match with the head and neck recipient site is common. If the patient is obese, a fasciocutaneous flap may not be possible. Lateral thigh flaps with large amounts of subcutaneous fat cannot be tubed adequately for laryngopharyngeal defects. The flap also cannot carry bone, but it can carry fascia. Contraindications to harvesting the anterolateral thigh flap include previous surgery or injury to the upper thigh compromising the pedicle. Morbid obesity may make the flap too thick and compromise the vascularity. As would be expected, the flap is usually hair bearing in males. Baek SM. Two new cutaneous free flaps: the medial and lateral thigh flaps. Plast Reconstr Surg. 1983 Mar. 71(3):354-65. [Medline]. Song YG, Chen GZ, Song YL. The free thigh flap: a new free flap concept based on the septocutaneous artery. Br J Plast Surg. 1984 Apr. 37(2):149-59. [Medline]. Koshima I, Fukuda H, Yamamoto H, Moriguchi T, Soeda S, Ohta S. Free anterolateral thigh flaps for reconstruction of head and neck defects. Plast Reconstr Surg. 1993 Sep. 92(3):421-8; discussion 429-30. [Medline]. Kimata Y, Uchiyama K, Ebihara S, Yoshizumi T, Asai M, Saikawa M, et al. 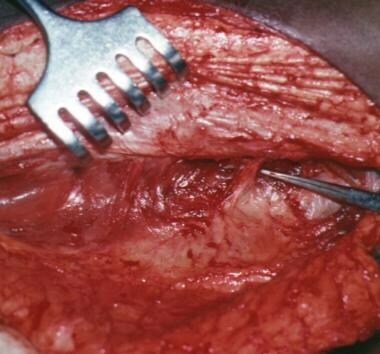 Versatility of the free anterolateral thigh flap for reconstruction of head and neck defects. Arch Otolaryngol Head Neck Surg. 1997 Dec. 123(12):1325-31. [Medline]. Xu Z, Zhao XP, Yan TL, et al. A 10-year retrospective study of free anterolateral thigh flap application in 872 head and neck tumour cases. Int J Oral Maxillofac Surg. 2015 Sep. 44 (9):1088-94. [Medline]. Sarkar A, Raghavendra S, Jeelani Naiyer MG, et al. Free thin anterolateral thigh flap for post-burn neck contractures - a functional and aesthetic solution. Ann Burns Fire Disasters. 2014 Dec 31. 27 (4):209-14. [Medline]. Luenam S, Prugsawan K, Kosiyatrakul A, Chotanaphuti T, Sriya P. Neural Anatomy of the Anterolateral Thigh Flap. J Hand Microsurg. 2015 Jun. 7 (1):49-54. [Medline]. Boca R, Kuo YR, Hsieh CH, Huang EY, Jeng SF. A reliable parameter for primary closure of the free anterolateral thigh flap donor site. Plast Reconstr Surg. 2010 Nov. 126(5):1558-62. [Medline]. Seth R, Manz RM, Dahan IJ, Nuara MJ, Meltzer NE, McLennan G, et al. Comprehensive analysis of the anterolateral thigh flap vascular anatomy. Arch Facial Plast Surg. 2011 Sep-Oct. 13(5):347-54. [Medline]. Kim EK, Kang BS, Hong JP. The distribution of the perforators in the anterolateral thigh and the utility of multidetector row computed tomography angiography in preoperative planning. Ann Plast Surg. 2010 Aug. 65(2):155-60. [Medline]. Saint-Cyr M, Oni G, Lee M, Yi C, Colohon SM. Simple approach to harvest of the anterolateral thigh flap. Plast Reconstr Surg. Jan/2012. 129:207-211. Hanasono MM, Skoraki, RJ, Yu P. A prospective study of door-site morbidity after anterolateral thigh fasciocutaneous and myocutaneous free flap harvest in 220 patients. Plast Reconstr Surg. 2010. 125(1):209-214. Revenaugh PC, Knott PD, Scharpf J, Fritz MA. Simultaneous anterolateral thigh flap and temporalis tendon transfer to optimize facial form and function after radical parotidectomy. Arch Facial Plast Surg. 2012 Mar. 14(2):104-9. [Medline]. Zhang WJ, Ebrahimi A, Kernohan MD, Clark JR. Anterolateral thigh flap fascia lata suspension in oral floor reconstruction. Laryngoscope. 2011 Mar. 121(3):555-7. [Medline]. Seth R, Revenaugh PC, Scharpf J, Shipchandler TZ, Fritz MA. Free anterolateral thigh fascia lata flap for complex nasal lining defects. JAMA Facial Plast Surg. 2013. 15(1):21-28. Dorafshar AH, Seitz IA, DeWolfe M, Agarwal JP, Gottlieb LJ. Split lateral iliac crest chimera flap: utility of the ascending branch of the lateral femoral circumflex vessels. Plast Reconstr Surg. 2010 Feb. 125(2):574-81. [Medline]. Sharabi SE, Hatef DA, Koshy JC, Jain A, Cole PD, Hollier LH Jr. Is primary thinning of the anterolateral thigh flap recommended?. Ann Plast Surg. 2010 Dec. 65(6):555-9. [Medline]. Higgins KM, Erovic BM, Ravi A, Yeung R, Lee JW, Yao C, et al. Volumetric changes of the anterolateral thigh free flap following adjuvant radiotherapy in total parotidectomy reconstruction. Laryngoscope. 2012 Apr. 122(4):767-72. [Medline]. Hage JJ, Woerdeman LA. Lower limb necrosis after use of the anterolateral thigh free flap: is preoperative angiography indicated?. Ann Plast Surg. 2004 Mar. 52(3):315-8. [Medline]. Tsukino A, Kurachi K, Inamiya T, Tanigaki T. Preoperative color Doppler assessment in planning of anterolateral thigh flaps. Plast Reconstr Surg. 2004 Jan. 113(1):241-6. [Medline]. Lethaus B, Loberg C, Kloss-Brandstatter A, et al. Color duplex ultrasonography versus handheld Doppler to plan anterior lateral thigh flaps. Microsurgery. 2017 Jul. 37 (5):388-93. [Medline]. Moreno MA. Video-assisted harvesting of anterolateral thigh free flap: technique validation and results. Otolaryngol Head Neck Surg. 2013. 149(2):219-225. Design of the flap incorporates a fusiform shape over the intermuscular septum, centered over the midpoint between the trochanter and the lateral femoral condyle. Two thirds of the flap is designed anteriorly because the blood supply is richer in this area. This cross-section of the thigh demonstrates third perforators. Successful dissection of the flap requires upward retraction of the vastus lateralis, ligation of tributary branches into the muscles, and freeing the short head of the biceps femoris and the adductor magnus from the femur. The leg is placed in a padded support. The knee is rotated inwardly to expose the posterolateral aspect of the thigh, including the intermuscular septum. Schematic view of the completed dissection shows that the posterior skin incision has yet to be made. Harvest of the vessels usually is made where the PFA joins with the second perforator (not shown). Appearance of a healthy flap is shown after anastomosis and inset. Note the pale color in comparison to the surrounding skin. Identifying the likely location of a perforator for the anterolateral thigh flap. The circle has a 3 cm radius about the midpoint from the ASIS and knee. The first incision for the anterolateral thigh flap is placed medially, over the rectus femoris muscle. Closing the donor site for the anterolateral thigh flap is usually straightforward. Skin grafting is necessary for larger defects.